Do the same old desserts adorn your dinner table every Thanksgiving? Give these new recipes a spin! 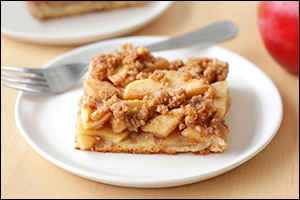 Satisfy a crowd with this two-word solution: SLAB. PIE. The holidays may never be the same! Place dough in the pan, and stretch into a large rectangle of even thickness, covering the bottom of the pan. Pierce several times with a fork. Place apples in a large bowl. Top with lemon juice, and toss to coat. In a medium bowl, combine remaining pie ingredients. Add mixture to the large bowl, and toss to coat. Evenly spoon apple mixture onto the dough sheet. Cover the pan with foil, and bake for 30 minutes. Meanwhile, in another medium bowl, combine streusel ingredients. Mash and stir until well mixed and crumbly. Remove foil. Evenly sprinkle streusel over the apple mixture. Let pie cool slightly, about 10 minutes. Slice and serve! Another HG Alternative: If made with an equal amount of Splenda No Calorie Sweetener (granulated) in place of the white sugar, each serving will have 159 calories, 28g carbs, and 14.5g sugars (Freestyle™ SmartPoints® value 5*; SmartPoints® value 5*). 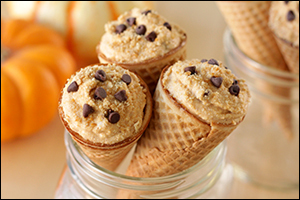 These are more than just a seasonal spin on an HG fave -- they may be our best cannoli cones yet! In a medium bowl, combine cream cheese, sweetener, cinnamon, pumpkin pie spice, and salt. Mix until smooth and uniform. Add ricotta cheese, pumpkin, and vanilla extract. Stir until uniform. Stir in 1 tbsp. chocolate chips and half of the crushed graham crackers (about 1 tbsp.). Evenly spoon mixture into the cones. Top with remaining crushed graham crackers and remaining 1 tsp. chocolate chips. Enjoy! Whether or not they're showing up to your feast, share these recipes with all your pals -- click "Send to a Friend" now!